And now it's time for the big one, folks. The record I've arguably been anticipating the most in 2017, the newest collaboration album from a musical genius and a veteran of progressive metal for the past twenty years. The sort of project that has pulled from dozens of acclaimed metal acts and inspired at least three albums that would chalk as progressive metal stalwarts and one that's a genuine 10/10 classic. And you all know who it is. Yes, folks, it's Ayreon, the project of Arjen Van Lucassen, who I last discussed in detail when I talked about his side project The Gentle Storm in 2015, and before then when I discussed the Ayreon album The Theory Of Everything in 2013 - which for the record nearly topped my list of the best albums of that year! Now that album did turn out to be a little contentious among some Ayreon fans - the story that felt distinctly separate from the Ayreon universe, the choice to structure the track listing in four mammoth songs each extending over twenty minutes, and a narrative that may have been a tad too abstract for its own good, especially with the ambiguous ending. Now I personally didn't care, but that might have been more because the narrative connected on a deeply emotional level that short-circuited most of my critical analysis: a young man with a neurological condition and complicated relationship with family finds new agency and a quest against a backdrop of theoretical physics, it hit a few too many close notes for me. But that didn't mean I was inherently skeptical going into The Source - for one, look at that lineup! James LaBrie of Dream Theater, fresh off his own extended progressive metal epic The Astonishing, Tommy Karevik of Kamelot, Tommy Rodgers of Between The Buried And Me, Russell Allen of Symphony X, Floor Jansen of Nightwish, Hansi Kursch of Blind Guardian, Mike Mills of Toehider, Simone Simons of Epica, Paul Gilbert formerly of Racer X and Mr. Big, and even Tobias Sammet of the symphonic metal super-project Avantasia, who the music press has loved to paint as a rival to Arjen before they buried the hatchet in 2008. I haven't seen a murderer's row of talent that loaded since Dave Cobb brought together Southern Family. 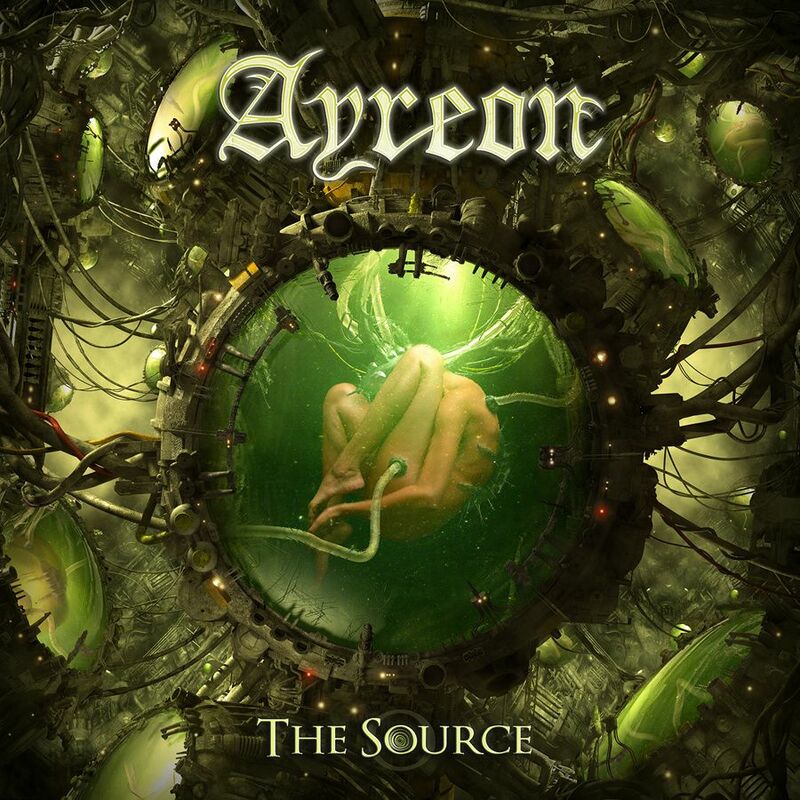 But The Source was promising more: a prequel album to the acclaimed 01011001 from 2008, telling the haunting story behind the collapse of the civilization behind the mysterious Forevers who have lurked behind so much of Ayreon's narrative. So on the one hand, it made plenty of sense for Arjen to cast the record with so many artists he's already worked with to deepen thematic parallels - or from what I could tell, maybe even play the same character again with Hansi Kursch and Floor Jansen - but on the other hand, prequels are always such a dangerous proposition, especially in a universe like Ayreon's with nine records stuffed full of interweaving continuity, with time travel to boot. But as always, my expectations were incredibly high, especially with buzz suggesting this could very well be Ayreon's best project since The Human Equation - does it live up to those expectations? Well, if I'm being brutally honest... this was a much harder review to write than I expected. My dearest hope was that I could come here, say 'This album is awesome, Arjen has done it again', and then spend the next ten minutes gushing over it and nitpicking whatever scant flaws I could find... but the more I went through The Source, the more I couldn't overlook some very real issues that I can't in good conscience excuse. And that's the frustrating thing, because when it comes to the actual music on the record - the production, the instrumentation and composition, the all-star vocal cast - Ayreon knocks it out of the park, again, and I can even say I can get behind a lot of the thematic arc and ideas of this album. But there's no way around the structural problems in the writing that make this record a lot harder for me to like as much as I wanted - and believe it or not, they aren't entirely prequel problems either! And believe me, if I could overlook those issues, I would, because when you consider the production and compositions on display here, this is easily one of Ayreon's heaviest and most explosive records in years, up there with Flight Of The Migrator and 01011001, and given that it's a direct prequel to the latter, if you liked a lot of the melodies and tones that ran through that album, this record will certainly satisfy you. The gargantuan swells of frigid synths and mechanical percussion that anchor the roars of guitar and heavy bass grooves, all interspersed with some of the richest folk and hard rock instrumentation Arjen has ever brought in without recruiting Troy Donockley - strings, flutes, tin whistles, Hammond organs, they're all here. And while there was a part of me that was a little reticent hearing some of the drum machines that did creep in, Arjen always manages to have them interlocking with the other mechanical elements so they never sound distracting or out of place, and they're used to pretty amazing effect in cranking up the tempos and grooves to some of the most aggressive in Ayreon's discography. Granted, there are definitely points where I think the instrumental should be a fair bit darker in order to match the content - all the major chords on the keyboards of 'Everybody Dies' is a little discombobulating even if the melodic hook is impressive, especially if you remember how dark songs like 'The Sixth Extinction' got, even if it does match a certain point-of-view in the apocalypse in process. But still, more often than not you get some stellar instrumental moments - I love the primary melody behind 'Sea Of Machines' and the sharper acoustic groove on 'Condemned To Live', the fiddles and acoustics play off a solid bass groove on 'All That Was', there were even hints of psychedelic funk on the opening track that I haven't heard from Ayreon in years, the sheer guitar-driven aggression on 'Run, Apocalypse Run! ', 'Into The Ocean', and 'Planet Y Is Alive!' is pretty damn effective, and as much as the hooks can feel a tad shrill, I do think 'Aquatic Race' and 'Journey To Forever' has some ridiculously strong hooks. And yeah, you can bet I enjoyed the tonal callbacks to 01011001, from the strings on 'Condemned To Live' to the blur of synth and strings on 'The Source Will Flow' - on the other hand, for as much as I liked that Arjen did experiment a little in terms of composition and tempo, I really was not wild about the Arabic portion juxtaposed with opera vocals on 'Deathcry Of A Race' - sure, the opening is potent, but it felt gratuitous. Granted, if you're going into an Ayreon record you can expect some excess in the vocals, and The Source certainly delivers. And look, I could go on about how Floor Jansen brings some of the greatest intensity of her career and that Tommy Kaverik arguably drives the core of this record, or how Mike Mills again subtly steals the show, but we all knew the talent here going in... if I'm going to nitpick, it'd come in a few places. For one, for as much versatility as Tommy Rogers shows, there's a part of me that wishes he'd have actually used some growled vocals, but really, that's symptomatic of how many of these vocal arrangements could have used a little more meat in the low-end, a few more heavier baritones, if only for modulation. Granted, this also ties back to the writing, because the instrumentation does take its time to ease back - and yet more often than not I find myself wishing that singers other than James LaBrie got the space to do the same. This is a record that often requires everyone to be at full volume consistently, and you find yourself cherishing the quieter moments to savor the melancholy or subtly crank up the tension - which is bizarre, considering as an eighty-eight minute album you'd think there'd be enough space here. But okay, I've danced around the issue long enough: let's talk about the story on this album. And again, it's not the themes or ideas or even some of the details where I find an issue, as Arjen is telling the tale of how those near-immortal and emotionally disconnected 'Forevers' that crop up all around the Ayreon universe were first created, once human, fleeing a planet they destroyed when they turned over all responsibility to machines, landing on a primarily aquatic planet and taking a chemical to adapt... only to inevitably succumb to machine dependence again. And let me stress I'm willing to excuse a lot here: how 'Sea Of Machines' references modern human technology despite being a long time ago in a galaxy far away, how the writing might lean a little heavily on established Ayreon iconography as a prequel - even if I appreciate the shoutouts not everyone will have heard Flight Of The Navigator or Into The Electric Castle - or how when you dig into the subtext this album is saying a lot about human hubris, short-term thinking, and repeating the same damn mistakes over and over again instead of actually understanding the consequences, all the more blatant when you consider how much of 01011001 this record subtly mirrors, including the desperate ambiguous hope that somehow humanity will find their vibrant emotional core and not be pacified by drugs, technology, or just the process of time. But this is where we have to start talking about the plot of this record and the biggest main issue: conflict. Namely, there isn't much of it at all, especially between the various characters, and when you consider the stakes of this record, there really should be. For starters, beginning the album in medias res as the machines start their takeover might be an exciting start, but it sets up the 'I told you so' moment between the world's opposition leader and president way too early for it to reflect a conflict between them. Then you have the plan to find a ship and flee, which sets up the fact these people are leaving a world of friends and family behind to die in the coming societal breakdown and robot apocalypse... and yet all of our cast winds up on the ship? Sure, 'All That Was' and 'Condemned to Live' references the loss of their race, but you don't get a sense of the angst or lingering consequences of this act from any of the cast on the rest of the project - they might mention it, but not to a point of impacting the narrative or any one character's choice. Because again, they all take 'The Source' - otherwise referenced as 'liquid eternity' for another callback - in order to live underwater on the new planet and become immortal and telepathically linked, but there's nobody speaking out against the loss of self or the greater consequences until its too late? And furthermore, not only why is the president still allowed onboard despite what he did on the original planet, but why is he allowed to bring another robot onboard without any serious question? These are obvious sources of conflict, questioning the collective mind versus the individual... but the truth is that many of these characters on this album don't feel like individuals in their writing, and the lack of greater diversity in the vocals from high belting tenors doesn't help this. And this is where tension becomes a factor: given this album is a prequel you need to heighten the tension and tragedy by showing someone with the foresight to question, or show these Forevers facing the consequences - but again, it's reckless hubris, and you can't really identify with an arc where history's going to repeat itself yet again. Now some of you might argue that this was also the case with 01011001, but the difference there comes in the fact that despite the Forevers' doomed mission to Earth, we got snapshots back to the planet to show exactly what was at stake - yeah, it was heavy-handed, but it showed there were consequences. This... for as long as this record is, there really is no excuse not to flesh out more of these characters, and if your point was to show humanity doesn't change with our reliance on drugs or technology and can brush aside tragedy when confronted with an escape... well, I still think the story could have been better told on a structural level to engage with the human drama, which is one reason why I praise The Human Equation and The Theory Of Everything so damn much. This... look, I do not want to say this record is bad, because it's not - from a compositional point of view and when you factor in delivery and production, Ayreon sets one of the highest standards in progressive metal. But for the cast they have and the fact that I am such an easy sell for this, I wish I connected with this story a lot more. As such, for me I'm giving this an 8/10 and a recommendation for Ayreon fans, and I really am praying the compositions grow on me enough that I can ignore the story issues more. But as it is... look, it's Ayreon, and while I wouldn't put this among Arjen's best, it's still worth a lot of your time, so check this out.